Have you checked the connector utlet/plug? Tried another charging wire? After deleting the errors and plug the charger only P1A12 coming at once the fans stopping. I ordered one Lexia from internet to check with it if any better. Regarding the old unit I keep it and yes it can be repaired if someone knows about that. Have you tried to disconnect some major components as the heater and AC-pump? I know it´s a long shot, but in theory it could affect the charging. 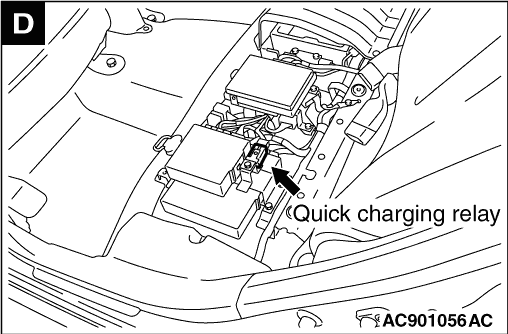 I don´t know if the fast-charge relay under the rear seat can affect the charging (if it stuck open..)?.. It might be something trivial. Try disconnect everything and reinstall it. As with faulty cartridges, diskettes or floppy disks, all you need is a magic blow. Have a look at basic things like fuses, connectors, loose fittings, o-rings etc. Are you sure the water actually flows? Are you sure there is no air trapped within? yes the water is circulating I've done the procedure for remove air more than 10 times. At the highest point we opened the temperature sensor and there is a lot of cooling fluid. All fuses checked and found OK. I ment stuck closed of course. It could explane the blown capacitors..
can you give me more info where is "fast-charge relay under the rear seat " if you know, please. I read somewhere there is is relay that allow fast charging, and it´s under the rear seat. I don´t know all the details about the function, but when the car communicates with the fast-charger it allows electricity to enter the battery. Under the rear seat there is a small compressor on the rihgt side(in case of flat tire), on the left side there is a cover, so I think the relay must be under there. It's "A kind of magic"
Can the relay from previous post cause this too ? No, not the fast-charge relay, it´s only active when using fastcharger. It´s probably your DC-DC converter (that converts high voltage to low voltage 12v). This is like finding the needle in someone's haystack elsewhere ... You should start working logical around this, and gather known facts and whatnot. No wonder the 12V won't charge when you still have errors in the same box. Are you sure the old OBC/DC-DC are faulty? Are you sure the salvaged OBC/DC-DC works at all? Have you looked in to the TIM - TechInfoManual? Have you studied the wiring diagrams in WM, ch. 90? PS! Where do you live? I'd like having a look at the old OBC. No news in the fart? Just about finishing that myimiev thread I found a library of twenty(!) OBC & DC-DC troubleshooting threads. Some are success stories marked [SOLVED/SUCCESS/SWAPPED_OUT/REPAIRED/REPLACED]. Thanks for your reply and the efforts trying helping me! 1. Are you sure the old OBC/DC-DC are faulty? - Yes. I can see inside on the bottom board two small blue capacitors blown and looks exploded. Siden ble generert på 0.037 sekunder med 36 spørringer.